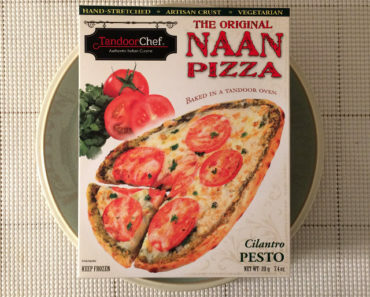 Here at Freezer Meal Frenzy, we’re pretty big fans of Tandoor Chef’s naan pizzas. We had nothing but good things to say about their Cilantro Pesto Naan Pizza, their Margherita Naan Pizza, and their Jalapeño Naan Pizza. 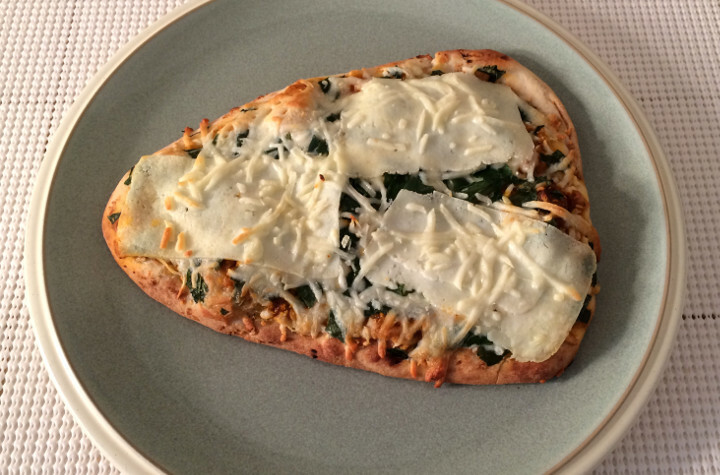 So we decided to delve further into this line and check out the Spinach & Paneer Cheese Naan Pizza. We love spinach, so this vegetarian-friendly pizza had the potential to be a real winner. One of the unfortunate things about these pizzas is that they don’t come with microwave instructions. These are intended for oven use only. While that doesn’t make or break this pizza, it might make us hesitant to heat it up on a day when we’re hungry and impatient and know there are microwavable meals in our freezer. But the shape is perfect — this pizza comes in a triangular shape like a Star Destroyer from Star Wars. 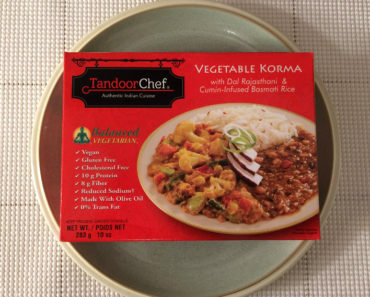 This makes it feel like a slice of a larger pizza rather than a single-serving pizza. And speaking of serving size, this pizza is supposed to be two servings, though we find that to be a little unrealistic. It’s easiest to just eat the whole thing at once. 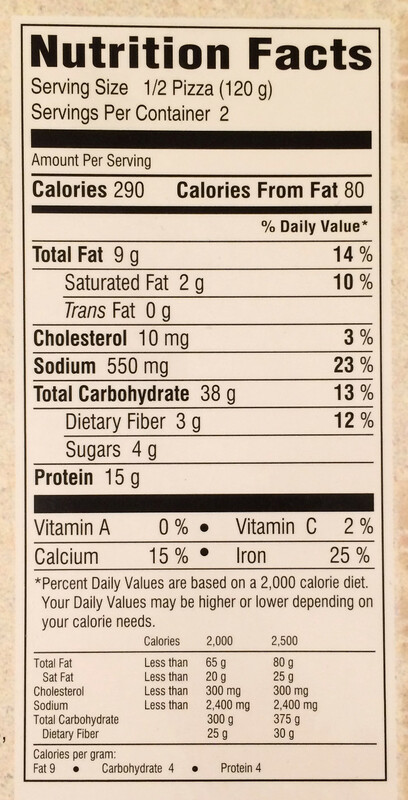 Just remember to double all the nutrition info on the back of the box. Yes, one pizza has 580 calories, not the 290 that a single serving is supposed to have. That also means it has 1,100 mg of sodium, which is quite a lot. But let’s move away from all that nutrition talk and get right into the part that matters most — the taste. 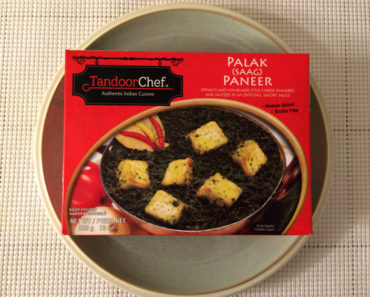 Now, just because this has paneer cheese on it doesn’t mean that Tandoor Chef left out the mozzarella. There’s actually some mozzarella sprinkled on top the paneer. While paneer isn’t melty like many other cheeses, it has a good flavor, and it’s really enhanced here with the addition of the mozarella. There’s some sauce in the middle, though it’s not a lot. We would have been happy with a bit more, especially since we weren’t thrilled with the spinach here. It has a weird, fishy taste, and the texture is a bit off. 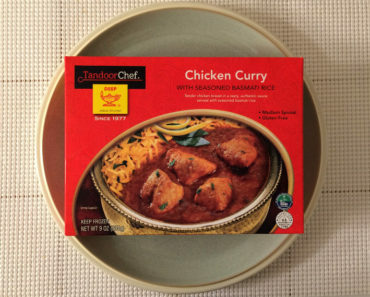 It dries out more than we’d like while it cooks in the oven, and this is likely the source of our texture complaint. The naan bread, though, is unreal. The biggest reason to get a Tandoor Chef pizza over any other brand is that this bread tastes phenomenal. It’s soft and chewy, though it will get crispy along the edges if you give it a few extra minutes of cook time. Either way, it’s loaded with flavor. 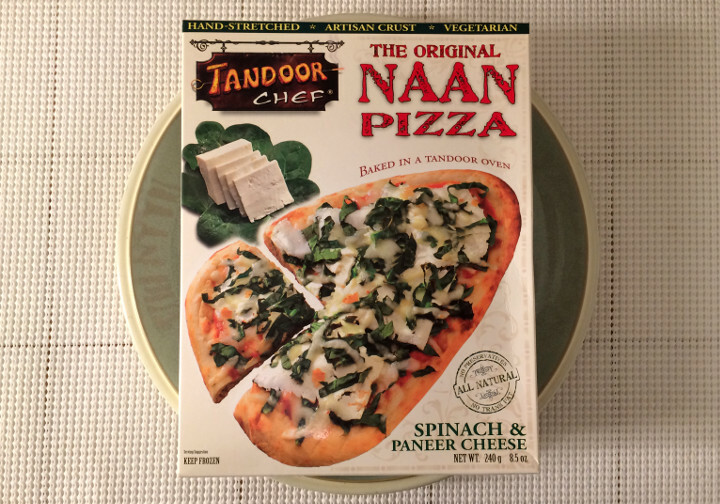 Tandoor Chef’s Spinach and Paneer Cheese Naan Pizza is excellent. 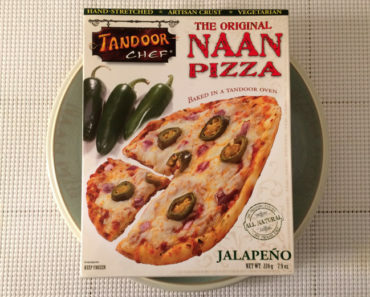 It’s a small step down from the other pizzas in this line, but it’s still one of the better frozen pizzas on the market. 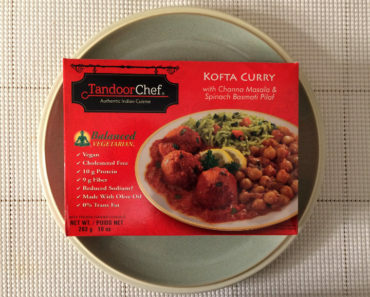 You should definitely give this a try. If you want to know more about the ingredients or nutrition facts for this frozen pizza, check out our package scans below.